I know of PinkBlush as a line of affordable and stylish maternity dresses and nursing clothing. I was pleasantly surprised to learn that they also offer women's clothes, too. The icing on the fashionable cake was that they have an entire separate plus sized section: for maternity, nursing, and beyond! While my maternity dress days are over, I'm still in need of stylish breastfeeding friendly clothes that I can wear after my nursling weans. I am thrilled to collaborate with a brand that makes motherhood look so good. PinkBlush's clothing can last you for years after pregnancy. This trendy online boutique features stylish maternity clothing, of which many items are nursing friendly. Once the breastfeeding days are done, the clothes can easily be incorporated into a daily wardrobe. Stretchy enough to access the breasts - yay for breastfeeding friendly dresses! 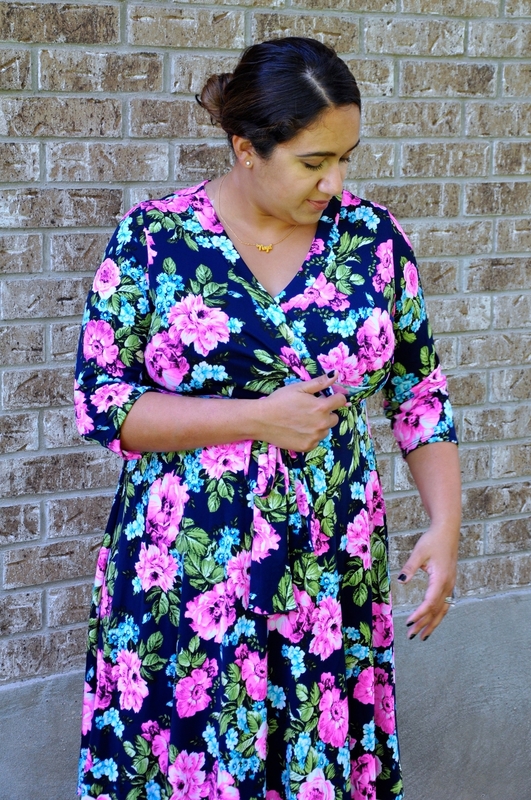 This floral wrap dress is very versatile - fancy enough to wear on date night or to work, but easy to dress down. I put it on and instantly felt put together, which is perfect for a busy mom like me. The wrap style makes it breastfeeding friendly, which is always a plus for me. I love that this dress can easily transition through different seasons of life. It would look great with a baby bump, stylish while breastfeeding, and fashionable while chasing toddlers! Want to win a $75 PinkBlush gift card? Participate in my Instagram Breastfeeding Photo Challenge and you could be the lucky winner! I did not receive any compensation to promote this giveaway. While I was gifted the dress pictured above, all opinions are my own and have not been influenced by the sponsor. For more information, please refer to this site's disclosure policy. This giveaway is in no way sponsored, endorsed, or associated with Facebook, Twitter, Instagram, or any other social media platform. PinkBlush will not be able to issue a gift card to the person drawn if they have won previously in the last 3 months.